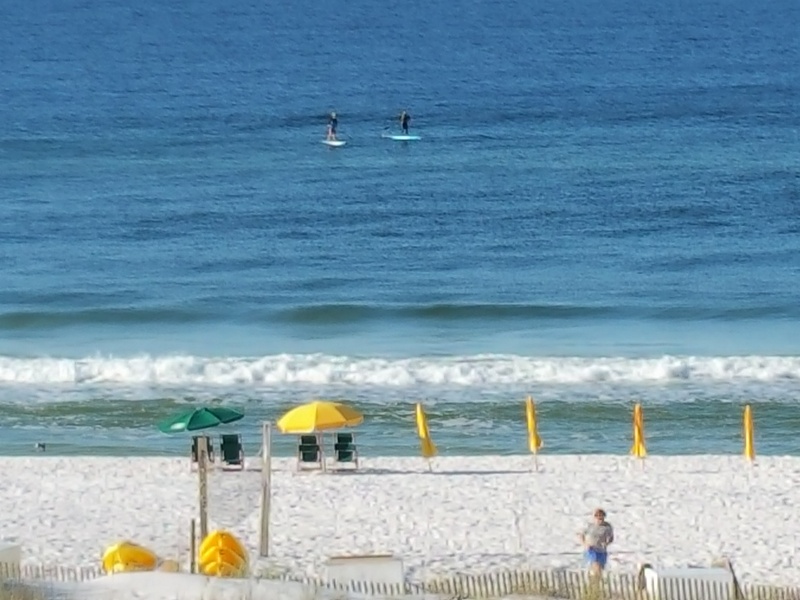 Standup Paddleboarders at Miramar Beach, seen from Hilton Sandestin room. 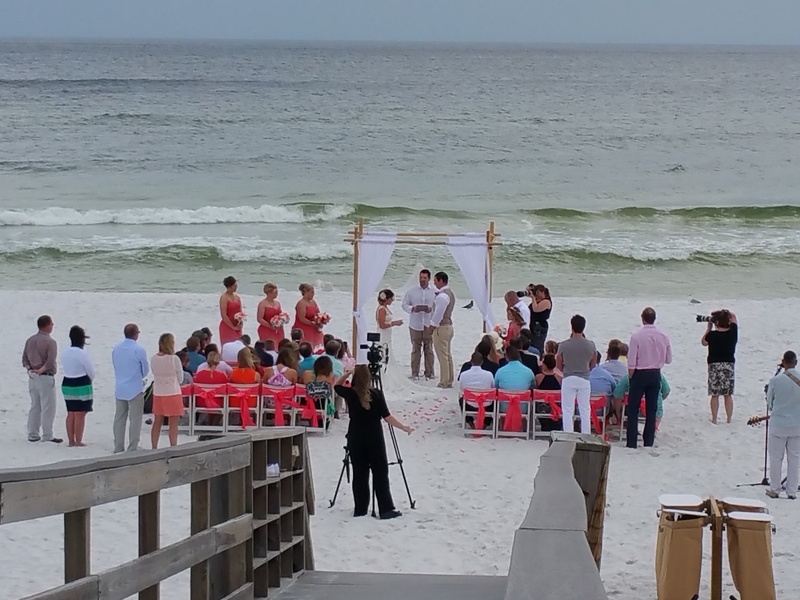 Wedding on the beach at the Hilton Sandestin Resort. 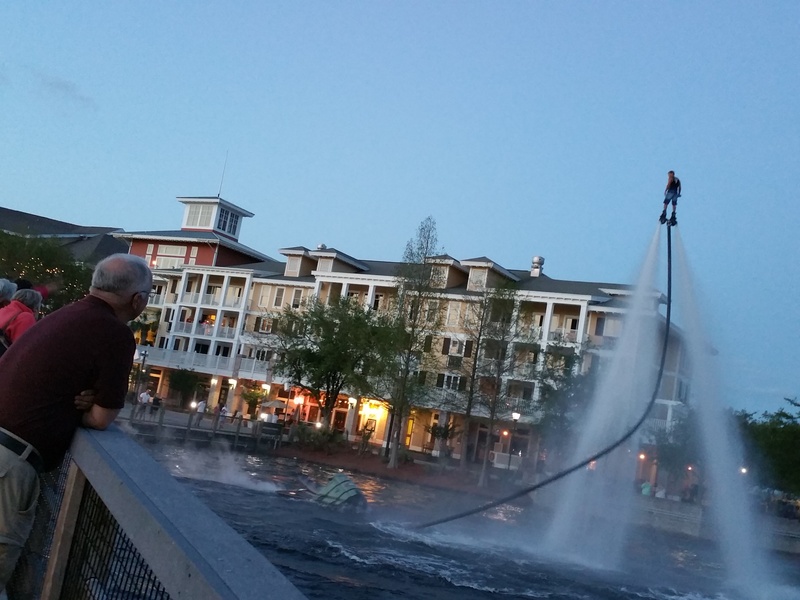 A Flyboard gymnast performs above the Baytowne Wharf lake. 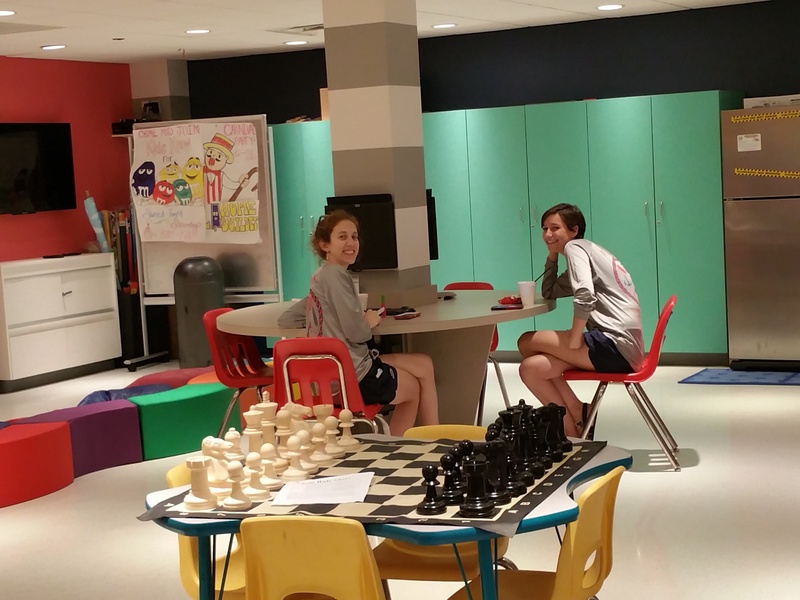 Kids have a bright activity room and supervised sessions at the Hilton Sandestin. Seaside is known for its beach cottages featured in the movie, "The Truman Show." Miramar is one of the only South Walton beaches with highrises. 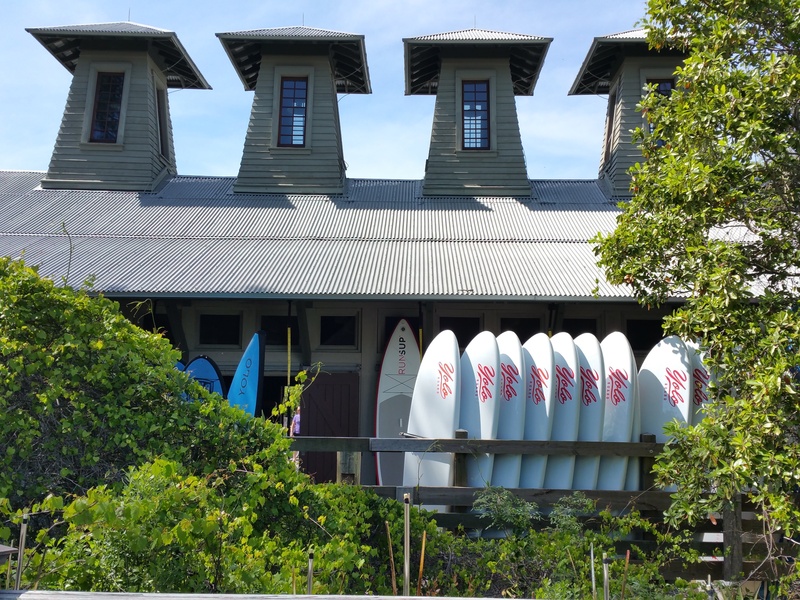 Boathouse Paddle Club is a fitness facility in Watercolor Beach, South Walton. We love to discover kid-friendly resorts that keep up with our ever-changing needs as parents, which is why Florida’s Hilton Sandestin Beach & Spa Resort gets a big thumbs up. While attending the TMS Family Travel Summit South Walton to hear new research about millennial family travelers, we could see how this hotel catered to them. Millennial families, more than other age group, say they prefer eco-friendly and off the beaten path getaways. 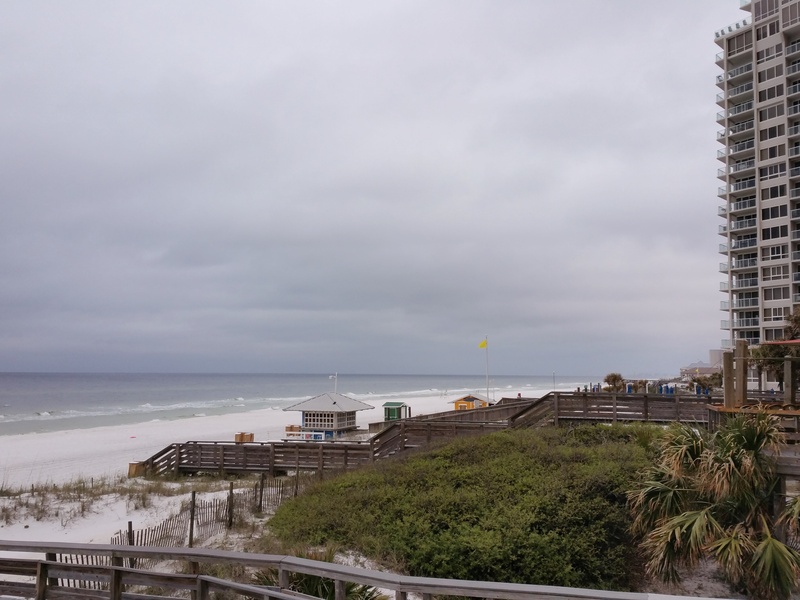 Although the Florida Panhandle is no secret to Southern families who drive there, we flew into the nearby Pensacola and out of the Panama City Beach Airports (check them both for cheapest flights). We were delightfully surprised by warm, sparkling green of the Gulf of Mexico and the pearly white, powdered sugar fine sand that stuck to our yoga mats. While it’s disappointing to see a modern highrise on Miramar Beach — smack in the middle of low dune grass and mangrove — once inside, you appreciate that the Hilton’s guest rooms are angled out toward the beach, or overlook the heavily wooded Sandestin Golf and Beach Resort across the way. South Walton is comprised of 16 pristine beach communities along Route 30A, an area people move to for quality of life. More than 75% of millennial parents look for a property’s eco-friendly initiatives and will participate in water conservation and linen reuse, done at all the major hotels. 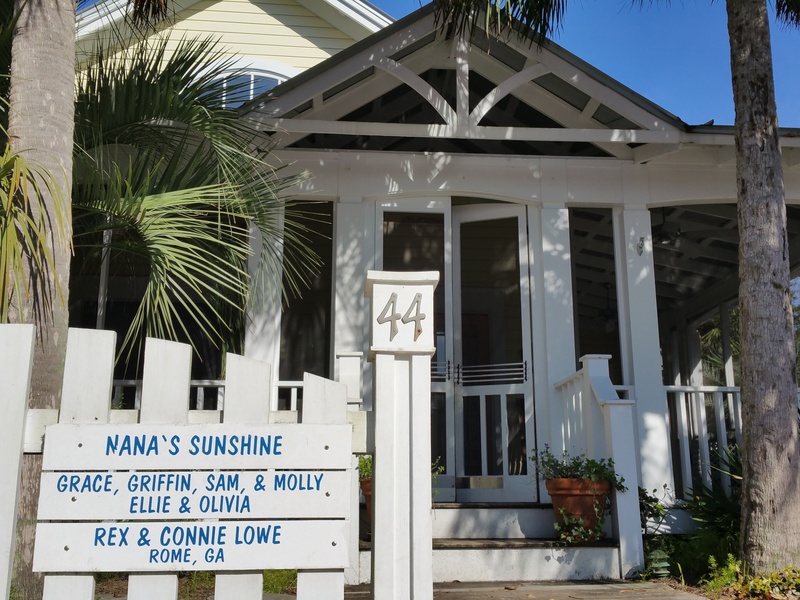 Nearby Grayton Beach has historic cottages and modern mini-mansions instead of hotels. Bicycling the 100-year-old roads, you get the sense that not too much has changed except the live music at the local favorite nightspot, Red Bar. You can pitch a watercolor easel (there’s a public artist-in-residence program for art classes) in Grayton Beach State Park -– and a tent, too. A coastal nature trail leads past scrub oaks and gnarled magnolia trees in a rare coastal dune lake habitat. You can rent kayaks to explore it, too. By the summer of 2018, the Cultural Arts Alliance of Walton County and the South Walton Artificial Reef Association will open the country’s first Underwater Museum of Art, in 60 feet of water .7 miles off Grayton Beach. They’re planning to feature several sculptures by different artists on top of grouper box reefs, in the hope that the sculptures will attract marine life. Along the 27 miles of beaches, the Friends of South Walton Sea Turtles welcome visitors to help out with the sea turtle watch and protect loggerhead turtles nesting on the beach between May and October. Millennials also prefer destinations with active adventures. There’s standup paddleboarding everywhere, and aerial fabric workouts in Watercolor Beach. You can visit the Topsail Hill Preserve State Park, Big Kahuna’s Water and Adventure Park, and the Gulfarium Marine Adventure Park (about 25 minutes by car). Pensacola Beach has vendors organizing snorkeling, jet skiing, sailing, and deep-sea fishing. As a base, the Hilton Sandestin delivers on location and value, with lots of free amenities, a kids activity room, a casual vibe and social lobby, three pools and two hot tubs in addition to the very appealing beach. The clientele is refreshingly diverse, in age, ethnicity and groupings. During our four-night stay in April, we encountered a bachelorette party, several wedding groups on the gorgeous beach for sunset vows, a huge number of families with young kids, couples, many seniors enjoying the fishing and the spa, and multigenerational groups who were reuniting at this easy-to-get-to location. Need a discount rental car for your Sandestin trip? Several major military bases are located nearby, a few of which train foreign career military. That means South Walton attracts a variety of foreigners as well. We credit them with the very cool food truck scene around the main square in Seaside -– where you can find Mexican, Thai, BBQ and more eats with an international flair. Fall brings lots of special events to the area. The last weekend in September, for example, pairs two of the region’s most popular sports: running and standup paddle boarding. The annual Run/SUP combines a 2-mile beach and dune run with a 2-mile paddle across Western Lake in Grayton Beach State Park. The Sandestin Golf and Beach Resort often hosts free concerts outdoors. Consider an autumn beach escape, when the water is warm and the weather is even better. In 2016, rates began at $309 per night plus a resort fee for a family of 5; perks included free breakfast for kids under age 11, WiFi, free tram transport to the Sandestin Resorts and Village of Baytowne Wharf dining and shopping complex, and a few other benefits. Plus this Hilton has HHonors Rewards programs, and discounts with AAA, AARP and the CAA of Canada. Use the Hilton Sandestin website to do your homework – you can price each of these once you determine your preferred dates and even choose “Flexible Dates” so you can see how prices rise and fall. Most importantly, let us know if you think the resort is meeting your family’s needs. Enjoy!